ORE + KK Null – listen. We’ve got a score of great gigs coming up, including Adrian Utley on 26th Nov at Library of Birmingham, performing Terry Riley’s ‘In C’ and Shellac + Helen Money on Monday 25th November at Rainbow Warehouse. Rounding up this trio of excellent shows is OM, always a fantastic live band, they’re joined by Lichens. Support comes from doom tuba group ORE, who will be playing as a trio. 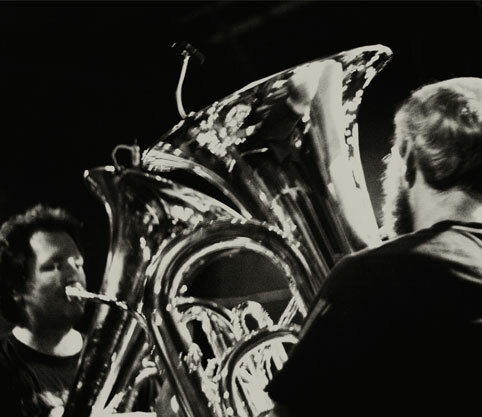 “Just three years into their dual-tuba project, Birmingham’s ORE continue to evolve rapidly. From early drone/doom beginnings their music has lately drawn inspiration from Indian classical music and other improvisational influences to become something much more difficult to define. Listen to a sample of their record with KK NULL, a project born out of their collaborative performance with the Japanese noise artists and Zeni Geva frontman at Supersonic 2012.